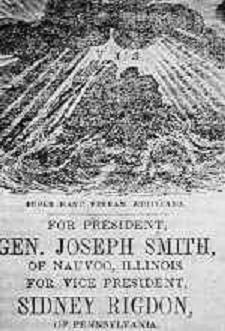 The first Mormon to seek the White House was also the first Mormon -- Joseph Smith Jr., the founder of the Mormon Church, whose 1844 presidential campaign is historically notable not only because it was the first one in which the candidate was assassinated. Smith's campaign 163 years ago was quite a bit different than Romney's, of course. In Romney's highly anticipated address Thursday about the role of faith in America, he only mentioned Mormonism by name once, and he invoked Abraham Lincoln's concept of "America's 'political religion' -- the commitment to defend the rule of law and the Constitution." Smith directly pushed what he called "theodemocracy," the blending of religious belief and democracy. 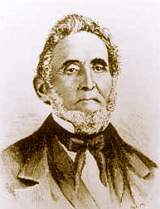 And his campaign was rooted entirely within the church that he founded; at the April 1844 Latter Day Saint's general conference, 244 church elders heeded the call to volunteer for Smith's campaign. In December 1843, under the authority of the Anointed Quorum, Smith petitioned Congress to make Nauvoo an independent territory with the right to call out federal troops in its defense. Then, Smith announced his own third-party candidacy for President of the United States, suspending regular proselytizing and sending out the Quorum of the Twelve and hundreds of other political missionaries. In March 1844, following a dispute with a federal bureaucrat, Smith organized the secret Council of Fifty with authority to decide which national or state laws Mormons should obey. The Council was also to select a site for a large Mormon settlement in Texas, California, or Oregon, where Mormons could live under theocratic law beyond other governmental control. In effect, the Council was a shadow world government, a first step toward creating a global "theodemocracy." One of the Council's first acts was to ordain Smith as king of this millennial monarchy.